This pattern is available for $2.00. The patterns included in this ebook are also available on my blog, but this is a convenient way to get an ad free, downloadable file. Project Description: crocheted flowers to slip over large solar lamps. Skill Level: Basic crochet skills are needed and must be able to read a crochet pattern. Yarn: small amounts of acrylic worsted weight yarn in 2 colors. Samples were made from Red Heart Super Saver yarn. 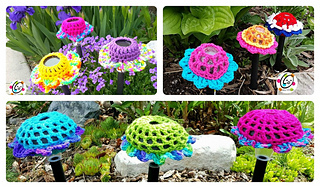 Miscellaneous: yarn needle; large, flat top solar lamp as shown (4” across top and 4” tall).